Ralph and Alice started the market earlier this year. 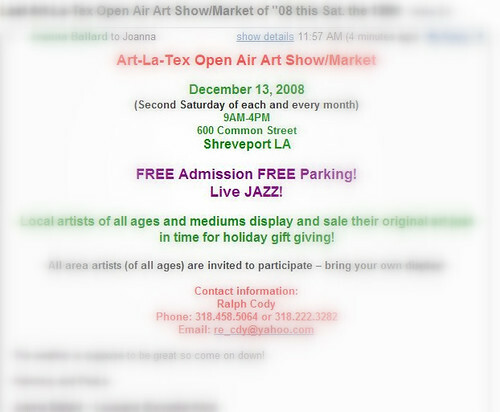 It was even featured on Trudeau's blog and can be found on the listed on the Shreveport Bossier Fun guide. P.S. The sold out Christmas in the Sky is Saturday also. Many times art from local artists can be found there but that money goes to SRAC. The money you spend at the market goes directly to the artist. P.P.S. Where would you be more likely to find the next Clementine Hunter, M.C. "Five Cent" Jones or Howard Finster? Downtown. Open air. Bring cash. Make deals. Go home happy and warm and fuzzy and do a winter dance around the cheerful glow of your newly acquired piece of art. What Does Your Mardi Gras Costume Look Like?